In the Hotel Oberstdorf you spend awesome holidays with authentic design of the Allgäu Alps and extremely sympathic hosts. Enjoy your time with great quality and many adventures around the Hotel. 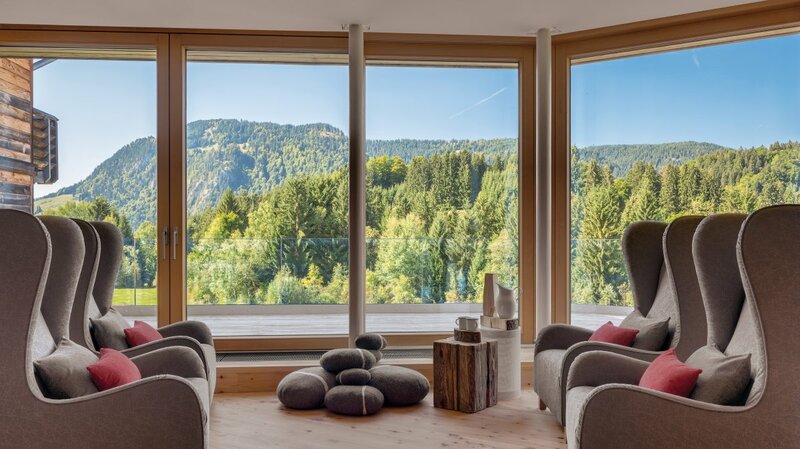 ... the stylish combination of traditional Allgäu components and modern design elements ensures pure well-being. 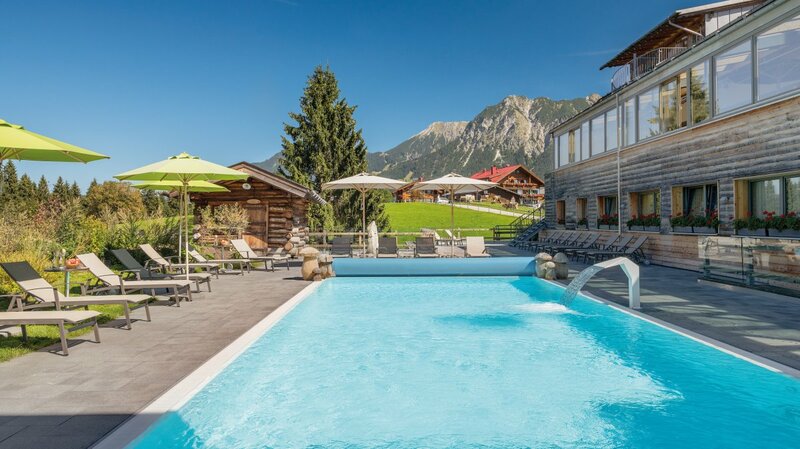 The spacious natural garden with natural bathing lake and barbecue area, the Alpine wellness world as well as details in the rooms take the guest on a journey through the Allgäu. The new Hotel Oberstdorf convinced by the combination of natural materials with modern design elements as well as the open and lively interaction in a casual atmosphere. It features 4 bright meeting rooms and 108 guest rooms and hotel apartments in a modern Alpine Feelgood design. Guests can relax in the unique alpine spa with various saunas and baths, heated outdoor saltwater pool as well as the 360 m² natural lake. In the evening enjoy gourmet dining at the “Alpen-Restaurant” with open fireplace. The Hotel Oberstdorf is an open home: every guest is welcome. Whether you are travelling alone and looking for peace and quiet in the most secluded corners of the mountains, planning a wellness trip with friends or an adventure holiday with family. You'll feel at home with us if you, like us, are approachable, like to communicate on equal footing, prefer an informal and friendly atmosphere and like our casual atmosphere. 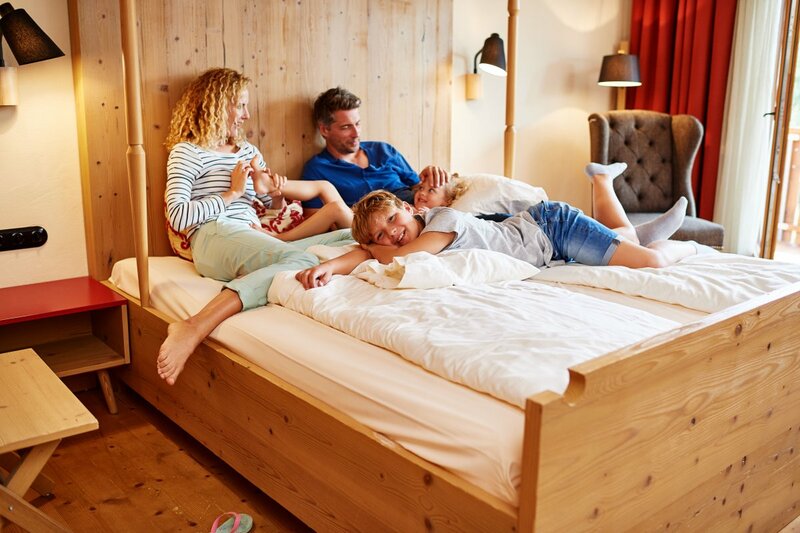 Choose from four different room categories: sporty alpine, stylish and modern, large and luxurious, or designed with plenty of wood and traditional Allgäu elements - a holiday at the Hotel Oberstdorf has many facets. The wonderful secluded location of the building also guarantees a wonderful panoramic view of the Allgäu mountains from almost every room. Prices are per person and night including an extensive breakfast buffet, free use of the 1500 m² Alpine Wellness World and fitness room, mountain railway ticket can be booked on site. Amenities: Sat-TV, telephone, Wlan, bathroom with shower, hair dryer, towels and bathrobes, wellness slipper, kettle for a warm cup of tea, high-quality cosmetic products, a pitcher of fresh water every day.